I prepared to jump from the Hula Kai Adventures boat into the endless abyss. I had no idea what to expect below. Resting stations were set up only feet from the boat, but in the dark of night on the Pacific Ocean I could feel my pulse quicken. Before I even stepped off the boat, I could see the gigantic shadows gliding through the water. I was about to snorkel with enormous manta rays in Hawaii. Even now as I type it, it doesn’t sound real. 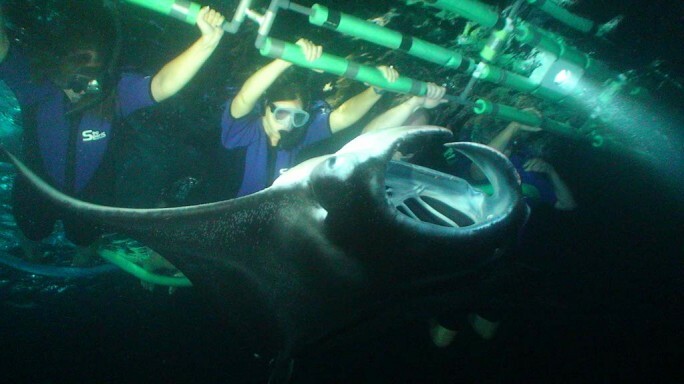 There are some opportunities in life that everyone should experience and snorkeling with manta rays is one of them. Manta rays are harmless relatives of the shark, lacking the tail stinger of stingrays. Their wingspan can reach up to 25 feet and they can weigh as much as 5,000 pounds. While that all sounds overwhelming, as soon as you witness their gentle, gracefulness you’ll understand why I was so calm. The water was illuminated by strategically placed waterproof spotlights on the seafloor. Bright light attract manta rays because they feed on plankton that drifts in the water and the light directs them to their food. As soon as I entered the water, I looked below the surface with my mask. I could see about half a dozen massive mantas flipping and turning but it wasn’t aggressive or intimidating. The gracefulness of each movement drew me closer. I swam toward the floating station that was set up and I rested my hands on the soft, foam bars lined up for each person snorkeling. There were about 25 other snorkelers in the water, including Darren, but I felt like the mantas were performing specifically for me. I quickly forgot about my fear of other water inhabitants and completely relaxed as the black and white mantas spun beneath me and at times against me. During the hour I spent in the water, several of the mantas swam so close to my body that I held my breath to avoid touching them. 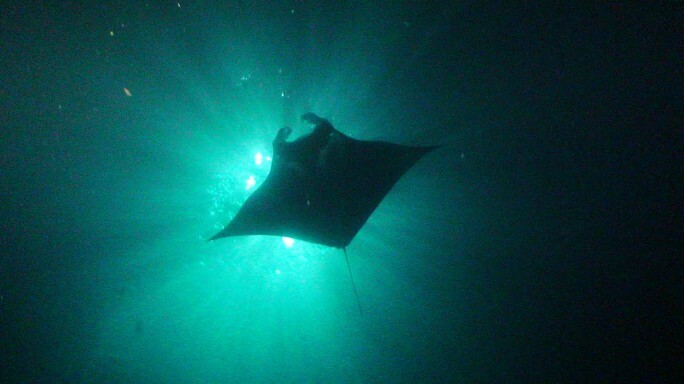 About half way through the experience, one manta was filling up on plankton as it danced below me. I sensed that it was getting closer than the others but I assumed it would turn before reaching me; then it happened. The manta brushed its body against my wetsuit. It was massive and its gigantic wings wrapped around the sides of my body before it turned away. I was in complete awe. It was more than an up-close encounter. I never imagined I would remain so calm but he was just gently saying hello before continuing on his way. A fear that once consumed me had disappeared and I gained a new respect and appreciation for these beautiful creatures. I watched the video and looked at the pictures when I returned to the boat. Again, I couldn’t believe that the whole experience was real. I felt like I just woke up from an elaborate dream. It was an outer body experience. Rather than just remembering it, I have a video to bring me back to Hula Kai Adventures and snorkeling with the manta rays. This entry was posted in Adventure, Hawaii, Travel, USA, Water Adventure and tagged adventure, bucket list, Bucket List Publications, bucketlist, Hawaii, Lesley Carter, manta rays, snorkeling, travel by lesleycarter. Bookmark the permalink. Shadows that go bump in the night… This is quite an adventure. It’s something I no longer associate with fear or worry though. Have you ever had a marine life encounter? Just the usual fish around the ankles in shallow ocean water, nothing like this. Wow! This looks amazing! A couple of questions: “snorkeling,” did you have to hold your breath? It looks more like diving, or some version of it. Did you have air, or did you hold and go under, and go back up each time you needed to breath? Given that Steve Irwin was killed by a ray, they are surely not harmless, so I’m wondering how they keep people from coming in contact? How far out were you? This looks incredible! We go to Hawaii almost every year, and I’ll be adding this to my list! Thanks for sharing! 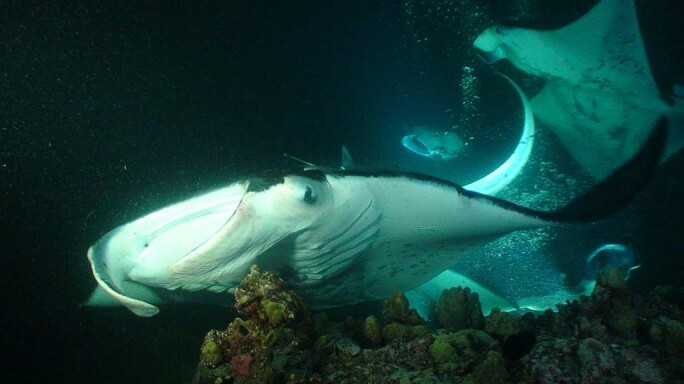 Manta rays don’t have the same stinger and stingrays, which is what happened to Irwin. You won’t regret adding it to your list. It was the most amazing experience I’ve had in the ocean. I can’t wait to read about how much you love it too! Wow! It looks incredible… and now I want to book our trip and do it. 😉 Thanks for sharing your amazing experience! This is the most AM-aaaa-zing story I have every heard. WOW. Now THAT is AWESOME! I wish I can also do what youre doing.. thank you for sharing this. It does give me an idea how beautiful under water is and scary as well.. lol! No way man. Tip of the hat to you for extreme bravery! Sure looks like a amazing experience. Think that it would be great. Really enjoyed watching the video! Absolutely amazing! You’ve inspired me to do this myself one day. I can’t wait to read about your experience. It’s something everyone should do at least once in their life. 🙂 Have you had any marine life encounters? I did my PADI Open Water scuba diving certificate a few years ago, and have gone diving in a few amazing places around South-East Asia and Australia. I actually tried to snorkel with manta rays once off the coast of Mozambique, but the water was too choppy that day and we didn’t have any luck getting close to any. Now I know to try it in Hawaii! Love reading and seeing your adventures…and this one is awesome!…but, Lesley…you can have it!… That is just not in my vocabulary or wants…but, I love being a participant in YOUR adventures! That’s incredible. The way you describe it sounds like he gave you a big manta ray hug! Experience of a lifetime for sure. Manta rays are so beautiful, it was my inspiration to one of my designs. 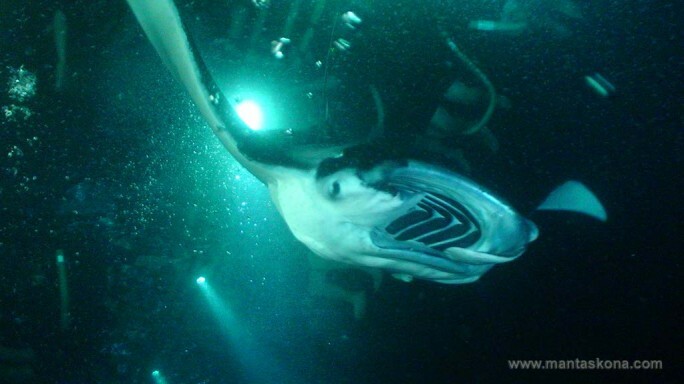 I have a couple of friends who saw a whole school of Manta Ray gliding away while they were on their dive. So envious. Very interesting. I still think you were brave!!!!! Whoa cool! I never would’ve considered this until now, mainly because I didn’t know they were harmless. I didn’t know the Manta Rays were that big, they had to have been very frightening for you but it seems like you don’t worry about it. This is a good one, I’d like to repost it if that’s okay with you. I snorkeled with Mantas in Hawaii once, and it was amazing. Such gentle giants doing those endless summersaults, and gently lifting us with their turbulence as they pass by. Thanks for bringing those delightful memories to the forefront of my mind. You are so brave! What an experience.